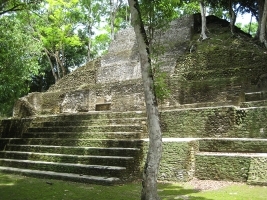 Cahal Pech is a Maya site located in the Town of San Ignacio in the Cayo District of Belize. The site was a palacio home for an elite Maya family, and though most major construction dates to the Classic period, evidence of continuous habitation has been dated back as far as 900 BC, making Cahal Pech one of the oldest recognizably Maya sites in Western Belize. The site is a collection of 34 structures, with the tallest being about 25 meters in height. The site was abandoned in the 9th century AD for unknown reasons. The name Cahal Pech, meaning “place of ticks”, was given when this site was a pasture during the first archaeological studies in the 1950s. It is now an archaeological park, and houses a small museum with artifacts from various ongoing excavations. This is another of the really easy ones. From in town, go to the police station and take the road on the right. It’s a huge hill. Follow the road all the way. Eventually you’ll get to an intersection with “Cayo Twist” ice cream shop on the corner. On the left you’ll see a park, and at the intersection you’ll see a sign that says Cahal Pech. At the intersection take a left, then a fairly quick right. You should be going uphill. If you get to Saddleback Grill, you’ve gone too far. It’s about 45min there and 20min back. Entrance is 10bz. If you don’t want to walk, take a cab. Be forewarned though, they don’t like to drive up the hill, so it’ll be around 10bz.